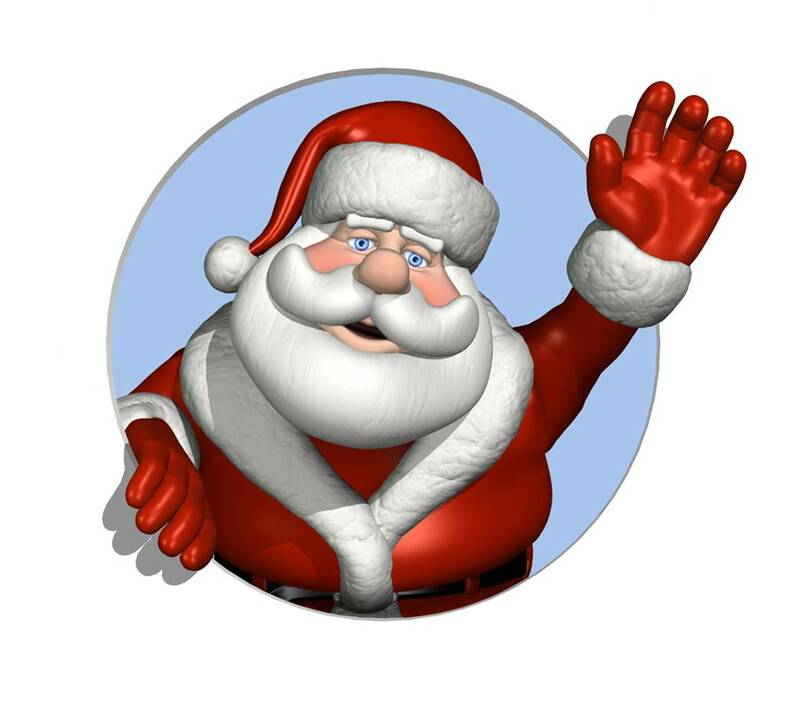 Events in December… #Christmas soon!!! He’s gonna be down your chimney soon. Hope you’ve been busy in the gym and saving your dollar throughout November people… For it is now December and ’tis the season to stuff your face with mince pies and roasts with wild abandon! Make sure to pop into The Rocket for the best priced coffee and occasional free mince pies if you’re lucky! 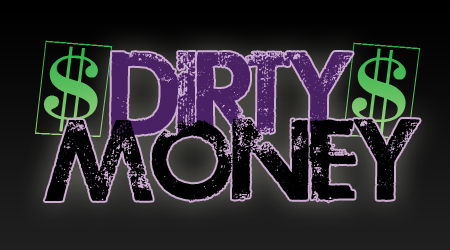 If you like urban music make sure to get down to $$DIRTY MONEY$$ on Friday 6th December. All the best in urban chart, RnB, hip hop, garage, soca, funky house, bashment and more. We’ve got DJs on rotation from 8pm… Special FREE ENTRY PRE-PARTY from 6pm with freshly made cocktails at the bar. LAST ENTRY IS STRICTLY 1AM. Tickets on the door only – £1 Metcard, £2 Any student, £4 guest of student. At 6pm every Monday and Tuesdays in December, the Back Room of The Rocket gets turned into a mini cinema, how cool!! It’s free entry, comfy sofas, warm and relaxing with the film starting at 6pm, with free popcorn and hot chocolate for 75p! 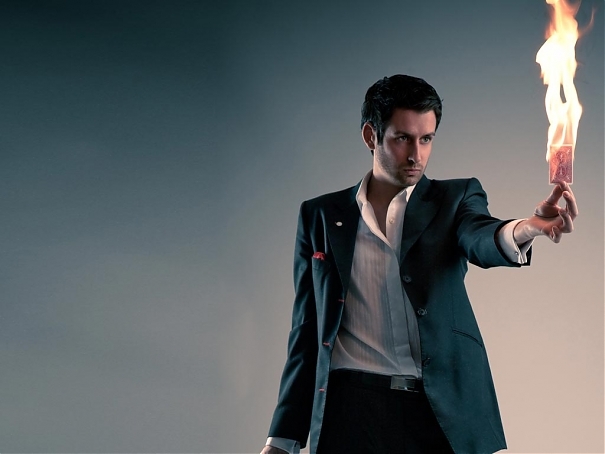 The film will also be shown on a screen with sound in the main room of The Rocket. 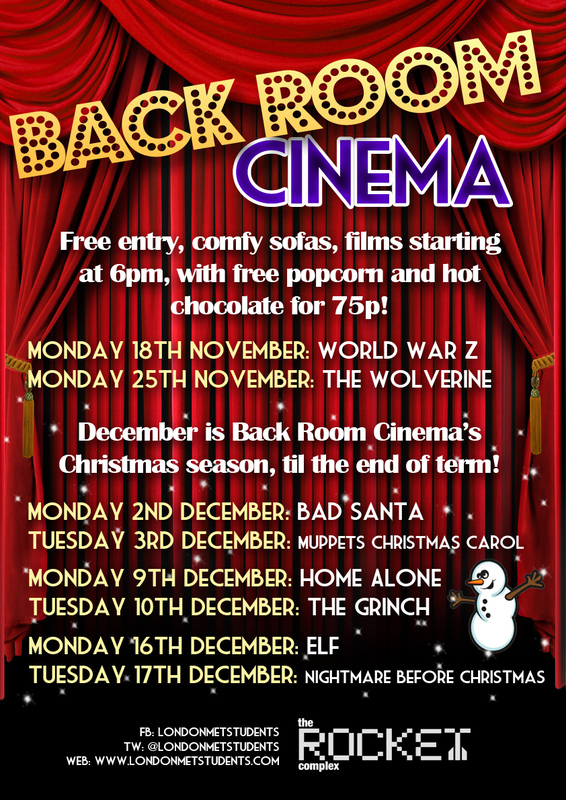 December in Back Room Cinema is our ‘Christmas Season’ all the way until end of term! 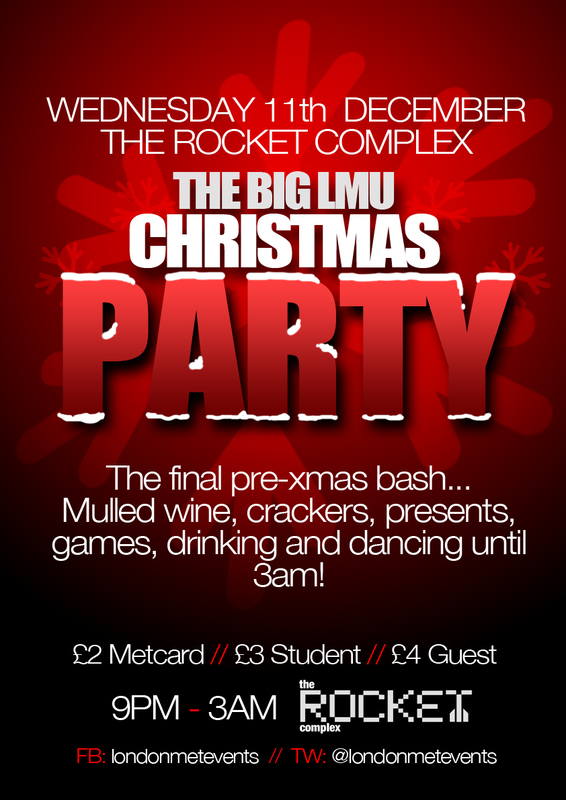 WEDNESDAY 11th DECEMBER – THE BIG LMU XMAS PARTY! Time to say goodbye to coursework deadlines and essays for a couple of weeks and there is no better way to celebrate with your friends than a big pre-xmas uni blowout! We’ll be partying like it’s the end of term and the year (oh yeh it almost is…) on WEDNESDAY 11TH DECEMBER! We have a very special night planned for all of you lucky LMU students full of xmas cheer, mulled wine and mince pies, dancing, games, drinks deals and awesome xmas entertainment!!! We can’t believe it’s December already and our stockings are already dangling nicely over the fireplace. Yeh right…. But we do LOVE EVERYTHING ABOUT CHRISTMAS. That’s why we’ve got a load of awesome festive events for you at The Rocket Complex. 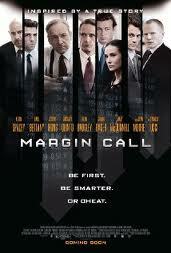 MOVIE NIGHT – Monday 10th December at 8pm. We’re opening Back Room Cinema one last time this term and showing the excellent “The Dark Knight Rises”. Comfy sofas and free popcorn! THE BIG XMAS STUDENT PARTY…. the FLIRT! CHRISTMAS SPECIAL. and even a flippin’ snowboard simulator!!!!! All the usual drinking and dancing from 9pm to 2am with special deals on Fireball all night, as well as ‘Fire Bombs’!! 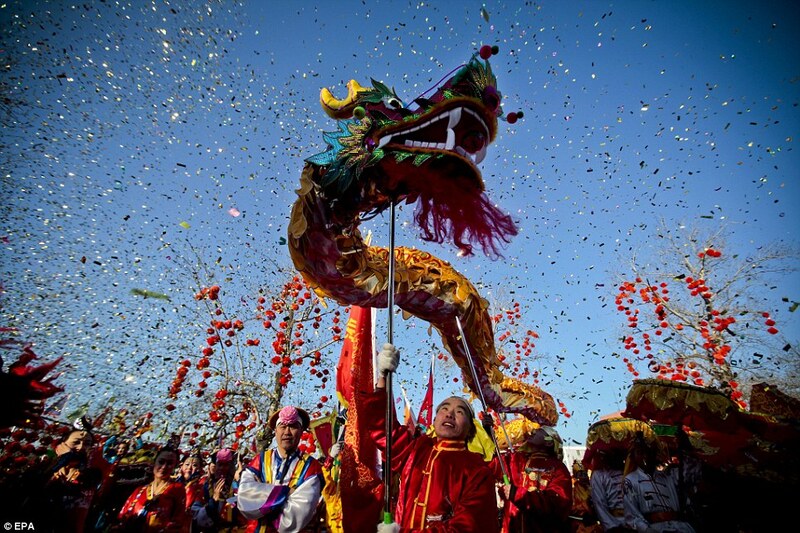 Free in fancy dress – otherwise £1 metcard, £2 ANY student card, £4 guest of student. All the details are HERE on facebook. is the BOUNCE Xmas Special. BOUNCE! 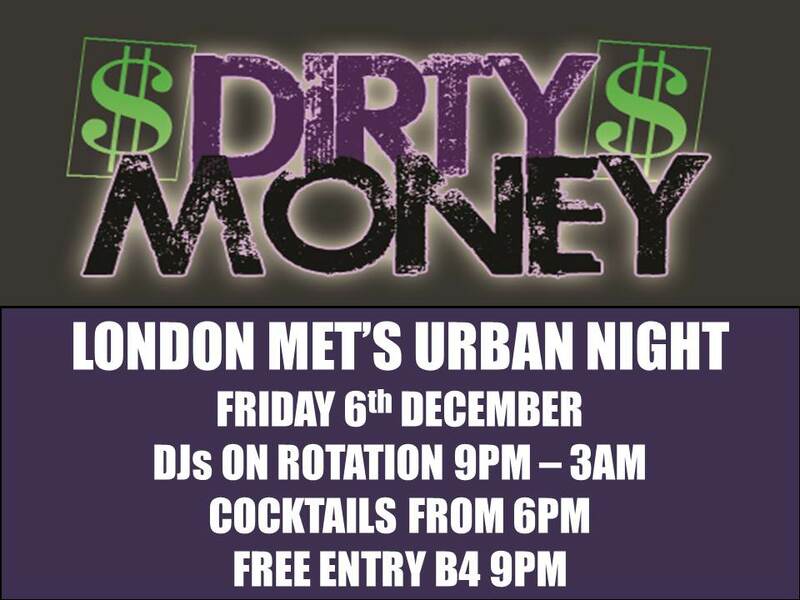 London Met’s own Urban Night. We have all your favourite Bounce DJs from throughout term on rotation. More mince pies and partying all night. Doors 9pm, free entry to students and guests, last admission strictly at midnight. Then to round it off we have DJs in the bar on Friday 21st December from 5pm – late with mince pies to keep you toasty and warm! Rocket is then closed from 22nd December until Monday 7th January. 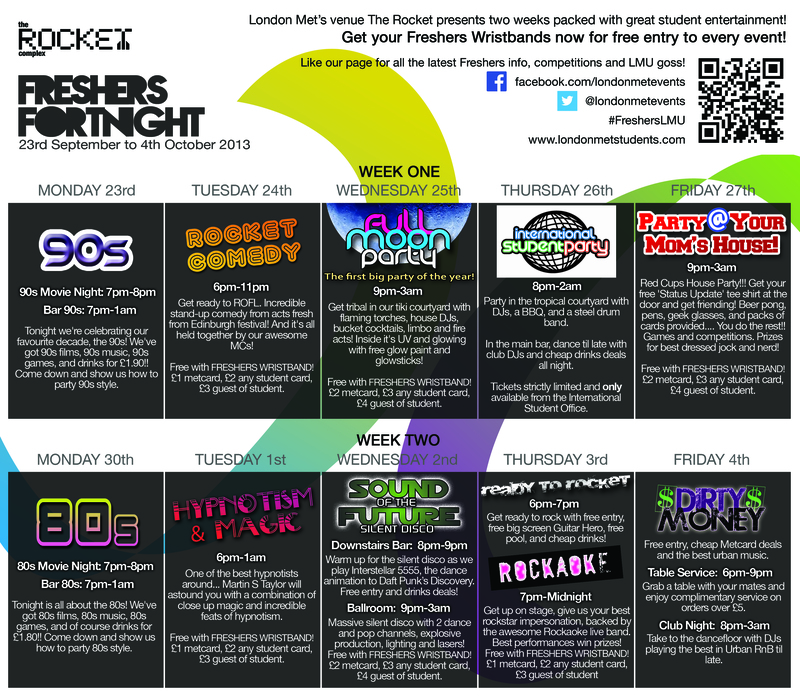 Student events upcoming at Rocket this term…. 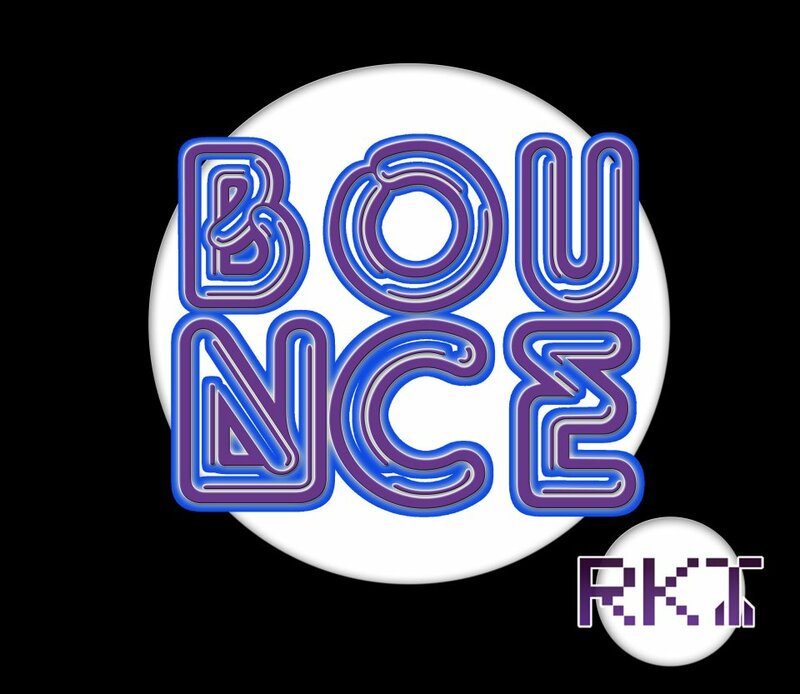 Friday 9th November – BOUNCE – London Met’s strictly Urban Clubnight. 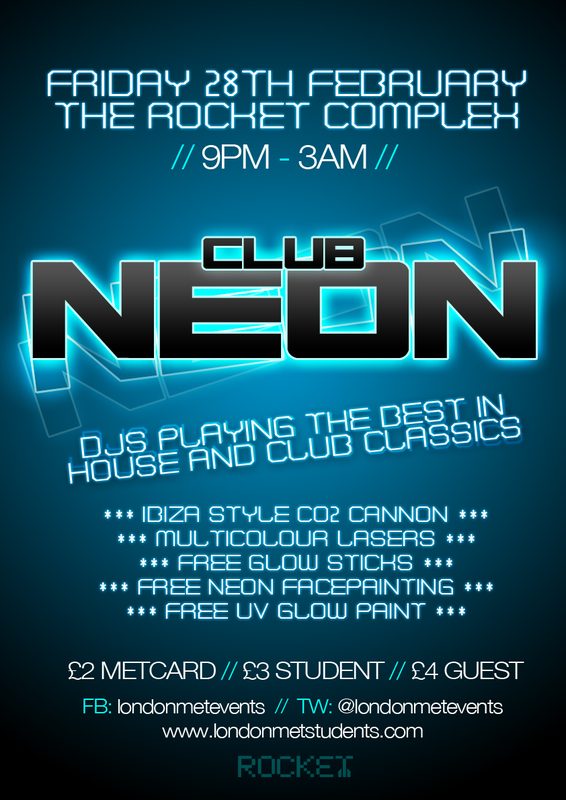 9pm – 3am, free entry. DJs on rotation. Last entry at midnight. Bounce! Selected Fridays throughout term. 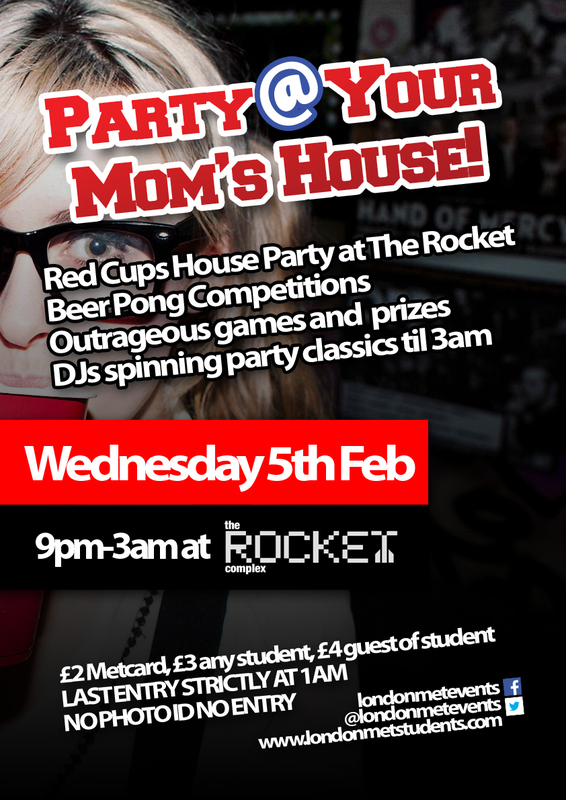 We turn the Back Room at Rocket into a cinema every Monday, with free popcorn, comfy sofas and great deals at the bar. 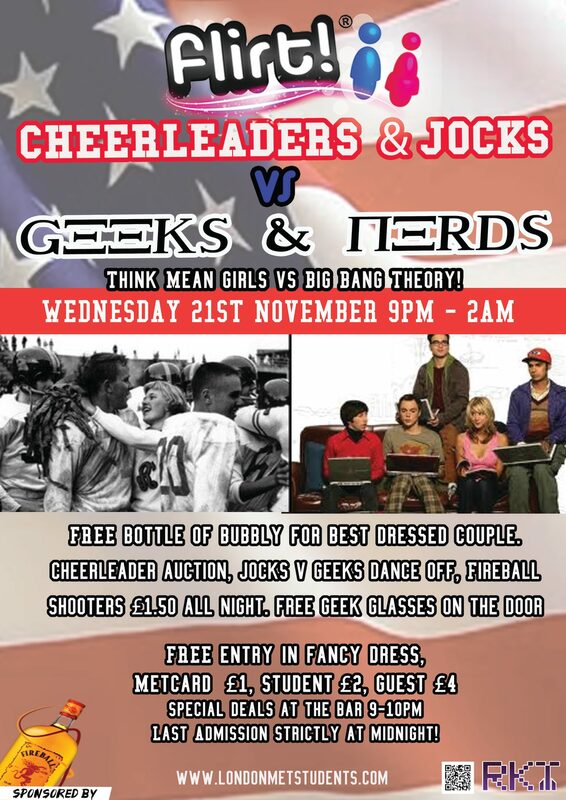 Our regular themed student clubnight, this time round it’s the revenge of the nerds! Think Big Bang Theory vs Mean Girls. Find the event and more info on FB here. Get your geek glasses on, or your athletics kit! Flirt! will also feature a sell out Xmas Special towards the end of term, watch this space! 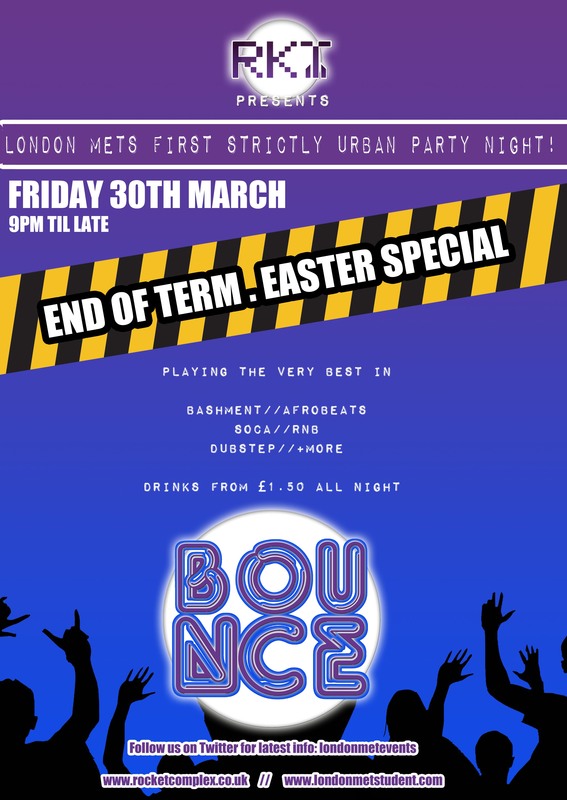 This Friday we have an end of term/Easter special Bounce (Strictly Urban) night planned @ The Rocket. As usual good tunes form RnB to Afrobeats but most important of all? Good vibes ! We can’t wait to see all of you come in and enjoy a night of cheap drinks and dancing until late close. Free entry for all of you so come in and show us what you got! You can follow Bounce on Facebook by clicking here. 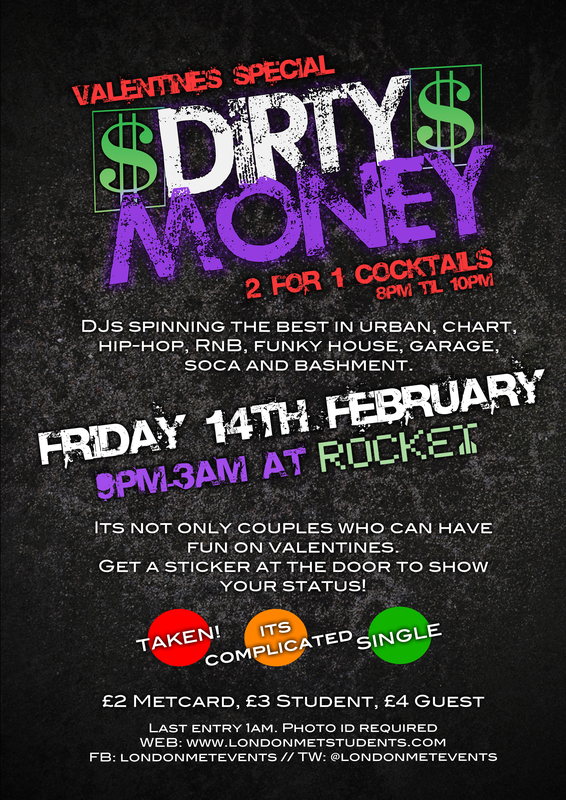 This Friday 17th we are welcoming a new strictly urban night called Bounce. We are really excited and can’t wait to hear some amazing tunes from Bashment to Soca never forgetting some cool Afrobeat tunes too. As usual we will have a selection of drink for £1.50 as well as free entry for students and sign up of two guests per person so bring everyone you know along for some ‘bouncing’. Join our FB event here and you could be picked at random to win a bottle of bubbly for you and friends on the night!! 30TH MAR, which will be an end of term super special night!